Americans owe more money now than at any time in history. The situation will become worse if individuals do not take steps to eliminate or reduce debt, instead of paying off credit card minimum payments to each credit card company. Making additional monthly payments accelerates the payoff and saves hundreds or even thousands of dollars in interest, which seems to somehow go up with each credit card statement. Without financial discipline, the average consumer suffers a significant thorn in the side called credit card debt. Penalty APRs and late fees add insult to injury. The debt crisis should be a wake-up call to Americans. Millions are learning to get credit card debt and spending under control. There are some encouraging statistics. A 2015 survey, conducted by Sallie Mae, found 85% of college students had debit cards. 56% prefer using them to credit cards. 51% did not feel the need to have a credit card while 47% wanted to avoid debt. The combination of education regarding credit card debt pitfalls and an upcoming generation wanting to avoid debt can cause a massive turnaround in the amount of debt Americans have. You need to develop a financial plan with short- and long-term debt payoff and a workable monthly budget. Disciplined spending is required. Credit card debt weighs heavily on the mind and wallet. Those tire of precarious payments and anxious feelings need to learn how to pay off credit card debt. There are few instant solutions, but there are steps to take to minimize the damage caused by credit card debt. Gradual improvement will lead to success. Daunting credit card balances sometimes causes people to make only the minimum payment or completely ignore debt. That strategy has dire consequences. Most credit card companies require a minimum payment of 1 to 2% of the balance. $6000 in credit card debt with an interest rate of 15% and a minimum 2% payment ends up costing the consumer approximately $9185 in interest. The payment would be $120 per month and take 355 months to pay off. The mega-interest is not the only problem. That kind of debt drags down a credit score. Amounts owed and payment history are two factors used to calculate a credit score. Getting on top of credit card debt as soon as possible is a wise choice. Choosing to be money smart lets you control debt instead of debt controlling you. Have a plan. Take stock of your financial situation. Round up all credit cards and track the crucial information such as the amount of debt, credit limit, interest rates, and minimum monthly payments. This information gives you a clear understanding of your status regarding debt. You will see which cards weigh you down the most. The data may be overwhelming, but it is the first step in creating a concrete plan to pay off credit card debt. Tackle cards with the smallest balances first. Small victories are excellent motivators. 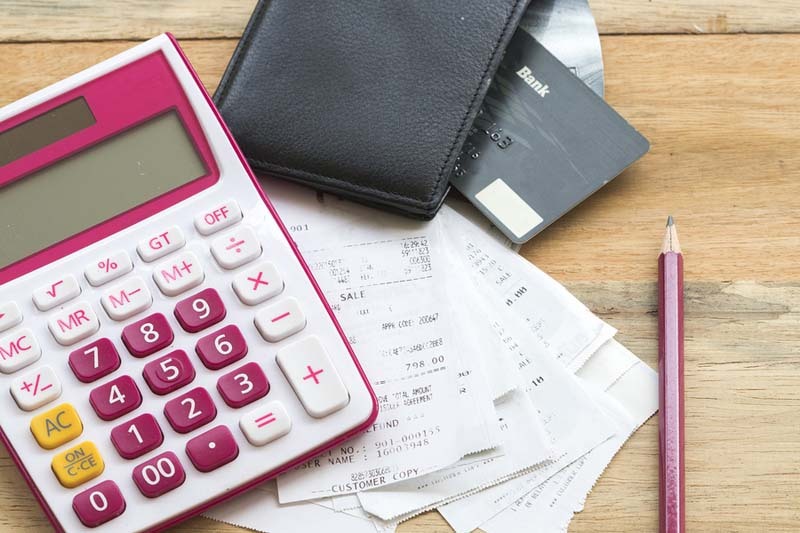 Use any of following credit card debt calculators to formulate your plan. There are online services you can use to determine how long it takes to pay off your credit card when making the minimum payment. Bankrate has an online calculator that you can use. Credit card information is entered. By pressing on the ‘View Report,’ the payoff details will be revealed. You will be asked for the credit card balance, credit card rate, and minimum payment percentage. The website allows information for up to five credit cards. The balance and interest rate are found on the monthly statement. To find the minimum payment percentage, divide the minimum payment by the balance. A quotient of 0.0311 is approximately 3%. The minimum payment will likely not be less than $15. The minimum monthly payment decreases as the balance is paid down. Decreasing the minimum payment extends the time it will take to pay off the card. The website also tells the total debt repayment amount. Credit Karma also provides an online debt repayment calculator. This calculator allows you to determine how long it will take for you to pay off a credit card when making minimum payments, fixed amounts, and a preferred time to be debt free. On this website, you are asked for the balance owed, the interest rate, the expected monthly payment, or the desired payoff timeline. Entering the balance, interest rate, and minimum payment will tell you how many months it will take to pay off the balance. The site also has a feature that allows you to consider options for increased and decreased balances; increased and reduced interest rates; and increased and decreased credit amounts. Creditcards.com also has a calculator that gives some very pertinent information in paragraph form. You can start by entering current balance, interest rate, and minimum due as the desired monthly payment to ask for calculation. The “result” button will tell you how long it will take to pay off the credit card and how much interest you will pay by paying the minimum. A table is generated that gives the monthly principal and interest paid and the remaining balance for each payment made on time. It does not take into consideration that minimum payments will decrease as the balance becomes lower. To pay off the credit card in the specified time each payment must be the same. This website will also give information under the result function when desired months to pay off or increased monthly payments are entered. The function generates the needed payment when the time frame is entered, the number of payments, and the interest saved by increasing the payment amount. The information also suggests an amount that will shorten the payoff time even more and tell how much more interest is saved. CalcXML has a calculator that lets you enter your minimum payment and a proposed additional monthly payment. The site generates a bar graph that illustrates how the extra payment affects accumulated interest. You also receive information that compares the number of payments, interest paid, and the time it will take to pay off the card for both options.